I didn't want to write this review. I mean that in several ways. Most obviously, I didn't actually want to write this review. Unfortunately, Strange Horizons found reviewers who did want to rather thin on the ground. But also, I had never wanted to write this review. I didn't want it to be necessary. So I didn't want to write it. But neither did anybody else, and I'm a sucker. In John Webster's revenge tragedy The Duchess of Malfi , the bullied and bullying assassin Bosola famously remarks, "We are merely the stars' tennis-balls, struck and banded / Which way please them" (V.iv.55-55). Bosola would have recognised what it now means to be a character on Ronald D. Moore's Battlestar Galactica . If the show has always attracted attention for the issues it deals with, the way in which it deals with them, and the positions it does—or doesn't—take on them, it was also once a show which dealt with the issues from a base of sound and consistent interpersonal dynamics. That is, its characters were people we could believe in and make sense of, individuals with personalities which informed their actions and reactions. However surprising the twist, it tended to make sense—and its repercussions tended to be fierce. In the early episode "Bastille Day," Apollo couldn't seek to enlist the help of prisoners without accommodating the malcontent Tom Zarek, who was simultaneously sympathetic and wrong; even in "Litmus," one of the more thematically muddled of the first season's episodes, the characters and their reactions remained inviolate, from Tyrol's baffled affront to Adama's careful firmness. In a show which has never been consistent in theme or even internal mythology, this character-based approach was the glue which held the show together. However shocking the revelation or roaring the explosion, the viewer could trust that no event on Battlestar Galactica existed in a vacuum. It was this, above all other things, which made the show worth watching. If season two's "The Farm" was troubling for all the wrong reasons, it nevertheless sat in the middle of an exhilarating run of episodes (probably the finest extended run the show has ever managed, and possibly still the series' high point) which filled every second with another bit of plot but never seemed to run out of space or humanity. Those days, however, are long gone. In its third season, Moore's show has become something quite different. The signs were there at the end of the show's sophomore run—its last episode, rushed and ragged, served provisional notice that Battlestar Galactica was now a series more interested in thrills and spills than any sort of thoughtful coherence or real moral complexity. And, this season, so it proved from the off. With the human survivors of the original Cylon attack camped on New Caprica, and a skeleton fleet not fit for the task of protecting them in retreat, season three begins with the story of a human resistance to a Cylon occupation. Thus enabled to address difficult questions about what are and are not acceptable asymmetrical tactics, Battlestar Galactica chickened out. In "Occupation," the season premiere, the show fumbled every conceivable question about the tactic of suicide bombing, from its efficacy as a tool of war to the morality of its contexts of use, by making its suicide bomber a soldier, and his targets a paramilitary arm of the occupying forces. It was as if the show wanted to pay lip service to the idea of being edgy and courageous without laying any of the tedious, difficult groundwork— Battlestar Galactica wanted to enjoy the effect of the outwardly contentious without in truth something which approached even mildly controversial. In "A Measure of Salvation," the crew engaged in a debate about the ethics of infecting the Cylon race with a deadly plague (we'll ignore for a moment Lee Adama's sudden and convenient transformation into a toaster-hating uber-pragmatist), but ultimately the decision is taken out of their hands and the only character to act—Helo, who ensures that Galactica's biological Trojan horse is rendered useless—gets away with his mutinous behaviour scot-free. There were fair questions to be asked by this episode: could the humans be justified in using a terrible weapon to ensure their (increasingly doubtful) survival, and have the Cylons entirely given up the right to enjoy the viewer's sympathy? Instead, "A Measure of Salvation" simultaneously simplified the issues through the use of Lee's newfound vengeful bent and then dodged the black and white question they did ask. Michael Angeli, the segment's writer, in this way followed what is by now a tried and tested Battlestar Galactica policy—strike the pose, dodge the bullet. But the moment at which this reviewer realized that Battlestar Galactica wasn't itself anymore came a little earlier in "Exodus, Part II." Saul Tigh discovers that his wife, Ellen, has been passing information about the resistance to the Cylon occupiers in an attempt to save her husband's life. Tigh confronts her, secures her confession, and promptly poisons her. Michael Hogan—enjoying a superlative period of unimpeachable performances—does his redoubtable best with this histrionic material. By this point, Tigh had already spent weeks in a Cylon prison, suffered through torture and lost an eye, ruthlessly administered a resistance and organised suicide bombings, and descended further into his persona of the misanthropic alcoholic. This is still not enough for the writers of Battlestar Galactica . They also require he be betrayed by the woman he loves, and that he execute her for this trespass. As Hogan sobs manfully onscreen, the viewer might be forgiven for asking how this man, who wouldn't even give up whiskey for the greater good, can suddenly be able to sacrifice his wife; but, in truth, the viewer may be too stunned by the sledgehammer being repeatedly brought down upon her head to notice. Of course, this moment results in many weeks of Tigh sulking around Galactica feeling sorry for himself. Then he gets a nicer eyepatch and everything's OK. It's perhaps too easy to be flippant about this level of emotional manipulation, but Battlestar Galactica deserves to be roundly mocked for the portentous simplicity of its recent episodes. "Collaborators," written by Mark Verheiden and the first full episode which takes place after New Caprica has been evacuated, sees Tigh and a half-dozen others take it upon themselves to charge, try, and execute humans who have helped the Cylons. It was the single bright point in an otherwise deadening procession of "issues" episodes more interested in shocking the viewer than making them think. A fairly compelling examination of the instinct for vengeance, if "Collaborators" nevertheless succeeded in keeping the hands of most of the series regulars tolerably clean, it asked the right kinds of questions in the right kinds of ways—without flinching and without hedging. By this point, though, the viewer had already begun to lose interest. Moore these days seems almost exclusively interested in the endpoint rather than the journey. So "Unfinished Business" needs to be a story about Apollo and Starbuck's relationship, and thus crafts an entirely unconvincing sequence of flashbacks to justify the resuscitation of their on-again off-again love affair. We are expected to accept this ret-con of the characters without question, even as we beg to know why not a hint of this sudden backstory has been dropped before. Similarly, in "Hero," Adama reveals that just prior to the Cylon attack on the colonies he had led an illegal incursion into Cylon space, thus arguably provoking the machines' devastating onslaught. The viewer resents such massive elements of backstory being conjured from nowhere. This is not merely another permutation of the show's hopeless attempt to equate the humans with the Cylons—there is simply nothing humanity could have done to fairly invite the holocaust delivered upon them by their robotic creations. It also exhibits a simple lack of respect for anything but the moment. If Battlestar Galactica wants to tell a story about Adama feeling guilty for causing Armageddon, it will tell it however it can. There is no pleasure in watching a series happy to rewrite its own mythology for the quick shock (predictably, in subsequent episodes, Adama's revelation has not been mentioned again). The Cylons themselves, with more screentime than ever before, continue to act like a band of over-equipped quixotic teenagers. Their new Plan, for those of us still bothering to keep score, is to find Earth. This results in a sort of intergalactic Wacky Races , in which the human and Cylon fleets are never far behind each other but neither ever quite in the lead. Lucy Lawless as Number Three, arguably overtaking Tricia Helfer as the show's principal Cylon, gets to enjoy religious visions and taunting James Callis as Gaius Baltar, but has become a sort of repository for all that is inconsistent and frustrating about the robotic race: their quasi-religious bluster, their simultaneous lack of deep philosophy, their incoherent strategies, their limping characterisation. If one week Three is torturing Baltar, and the next she is sleeping with him, we can explain it to some extent by way of Baltar's colossally entertaining psychoses—but it has much more to do with writing that seems incapable of joining its own dots. This is a problem familiar to veterans of the second half of season two, in which episodes frequently over-ran and frantic editors cut scenes like so much summer grass, only to reinsert them into the "previously on" sequences of later installments. It still seems astounding that TV writers can fail almost every week to write their episodes within the constraints of their medium, but season three has seen the same phenomenon recur to familiarly detrimental effect. In particular, the disastrous "The Passage" failed to sell either of its two storylines—one about the past of Viper pilot Louanne Katraine, the other focused on Galactica's efforts to replenish the fleet's food supply—because neither was given enough room to breathe. The drama of the episode subsequently fell flat, simply because the whys and wherefore of what precisely was happening—how did the fleet's food so suddenly deplete, why has the shadowy figure from Kat's past never sought her out before—are left unaddressed. Other vital plotpoints—the purpose and strategy of the fleet's jumps into and out of a star cluster with high radiation levels, for instance—are explained, but in so rushed a fashion that the viewer is left playing permanent catch-up. 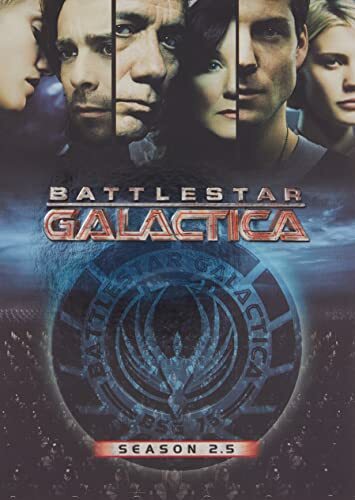 All of this is doubly frustrating because it is not as if Battlestar Galactica does not still have its rather good points: the show's cast is full of talented actors capable of adding depth and believability to the material they're given, and the direction and high production values of the final product are often cinematic, and never short of effective. Galactica has punch, but has lost its follow-through. Its impact has been reduced. When writers fall back on characters remarking just how unlikely is a particular plot, as Felix Gaeta does in "The Eye of Jupiter," the December cliffhanger episode presumably meant to leave us all wanting more, there is something lazily wrong at the heart of the show. Moore now demands our attention by way of hollow spectacle—a suicide bomber here, a biological plague there, a false sprinkling of false culpability for seasoning—and delivers his message with all the subtlety of a line drawing. Lee's depression is signified by a fabulous fat suit, while his affair with Starbuck ratchets up so rapidly that his confrontation with her husband has all the posturing of teenage angst without any of the emotional complexity. If the show is still capable of startling imagery and intriguing ideas (the Hybrids which control the Cylon base ships; the moment where Zarek and Roslin, about to be murdered by a Cylon death squad, comment wryly about the consequences of doing the objectively "right" thing), ultimately its now total sacrifice of character and world to issue and explosion still robs most of them of the ability to make a lasting, meaningful impression. Battlestar Galactica hasn't merely made its characters into tennis balls. It's just plain lost its serve. Well, you could always have got me to review the show if offers were so few on the ground. Or any of the other millions of people who really enjoy the show. This just seems like BSG backlash to me. The basic jist of this review seemed to me to be that there are loads and loads of really good things about BSG, but also a few naff things and on that basis its no longer any good. Heads up - there have always been some eminently naff things about BSG. Chief among them, its never been shy of using empty spectacle to pull in viewers. But its a TV show, empty spectacle is part of what people like about it! The character interactions if anything have become much stronger in the first half of season three. You could have predicted reviews like this at this time. BSG has rushed in and stolen the crown as most popular sci-fi series and left some disgruntled reactions along the way. Oh well, that stuff happens, and the show is still great fun and totaly gripping. To be fair, I wanted Dan to write this review because he wrote all our other Galactica reviews -- I like that sort of continuity. But it's also true that I asked four or five other people, and none of them wanted to do it, either because they'd already written about Galactica elsewhere, or because they had similar reservations to Dan, or both. This is probably the only review of Battlestar Galactica that will ever reference The Duchess of Malfi. Kudos. Musings on problems with BSG: I wonder if part of the reason the show is losing its way is that it's never quite known where it was going in the first place. A show like Doctor Who is based around a situation - bloke with bad clothes taste travels around the universe but somehow finds that interesting things only ever happen on Earth - that can accomodate a number of different stories, and so there is no need when writing the first episode to know what happens in the last. BSG's set-up, on the other hand, is built around a story, humanity's survivors' quest for Earth. The story cannot end before the fleet reaches its destination (or the Cylons wipe them all out, or they all get bored and give up, but neither are exactly satisfactory outcomes). Yet I doubt that even now Moore has much idea of when they will reach Earth, and what they will find when they get there. It's entirely possible that the series bible suggests that they will never reach Earth (that's certainly what Six-in-Baltar's-head says, though, whilst she has access to knowledge nobody else has, she doesn't know everything, as her reaction to Gina-Six demonstrates). I don't think Moore has anything like the five year plan Straczynski had for Babylon 5 (perhaps partly though having seen the way that plan had to be torn up as actors left and networks dithered about renewals). This puts BSG in the same bracket as Lost, as a show that appears to be pretty much making it up as it goes along. Of course, you can argue that the series is about the journey, but if a journey has no destination, then it simply becomes a wander. Further musing: Interesting though it is to see the implacable enemies actually having disagreements amongst themselves (kind of like seeing a group of Daleks having one of their 'discussions', and one of them saying 'I'm not sure that's a good idea'), boy are the Cylons dim! In particular, the Heroes of the Cylon are very dim! "We want to begin a new era of humans and Cylons living in peace! I know, let's put them under military occupation! They'll love us for that!" Who thought that was a good idea? And if they did, why don't they object to all the other Cylons' suggestions of imprisoning and shooting humans as entirely counter-productive? See, dim. Final musing: The cultural unity with the twenty-first century western civilization of our own planet is starting to set up unexpected, and perhaps unwanted, trains of thought. For instance, at the end of 'Precipice', at the 'rest stop' I found myself thinking "Look out, you're all in danger! Have none of you seen The Great Escape!" before realizing that, of course, none of them have. I largely sympathise with the criticisms in this review, and I think that Tony makes some very accurate observations about the show's aimlessness in his comment. I'm also not entirely opposed to the series' tendency to fling ideas against the wall to see what sticks, then run away to watch the reaction from a safe distance. Although scattershot and underdeveloped, the mere presence of the ideas is welcome. In particular I disagree that the suicide bombing is soft-pedalled. While it's not as hard-hitting as a full-on parallel to modern terrorist violence, the episode is quite careful to show the sympathetic faces of the young, naive recruits who are the victims of the bombing. Army, police or otherwise, it's still an atrocity. Ultimately though it's the show's disconnected jumps from episode to episode that are its undoing. As you rightly point out "Hero" and "Unfinished Business", are case studies for what the show is getting wrong. They wreak wholesale retcon on the series, and not for the first time. In particular, "Hero" is so out of step with the show's regular continuity that it feels like one of those Star Trek episodes in which a massive issue is raised and dropped within the space of a week, never to be spoken of again. What it seems to imply is that the writing team are so desperate for story ideas and so in love with the all-singing, all-dancing high-concept that they have neither the time nor inclination to either come up with something better or weave these tales into the fabric of the series. "Unfinished Business" I found more successful on its own terms, but it's undoubtedly robbed of the majority of its impact because the series has utterly failed to leave the required trail of breadcrumbs in the preceding episodes. Okay, pulling a nice reversal is good once in a while, but this looks far from cleverly-planned. It smacks of the same plotting flaws that blighted the late second season, in which every development emerged out of the blue, if not being actively contradicted by the way the characters were behaving the previous week. The Cylon side of the story is now the more successful, I think: not because it's strong enough in isolation to carry the show, but because it genuinely feels as if it's going somewhere. It's by far the most consistent and gradually developing element of the series; the equivalent of Helo and Sharon on Caprica in Season One. Commenting first on a minor aspect of this review... It says "So 'Unfinished Business' needs to be a story about Apollo and Starbuck's relationship, and thus crafts an entirely unconvincing sequence of flashbacks to justify the resuscitation of their on-again off-again love affair. We are expected to accept this ret-con of the characters without question, even as we beg to know why not a hint of this sudden backstory has been dropped before." I thought that this episode rather effectively explained the hint of backstory we did get in the season 2 finale, when Kara was strangely reluctant to ask Lee for medicine for Anders, who had pneumonia. Clearly, something had gone seriously wrong between Kara and Lee, but what? I speculated during the break between seasons that perhaps Lee had grounded Kara from flying for her increasing drunkeness. I looked forward to an explanation, and I got one. On another note, I do agree with the review that the plague issue and Helo's actions were illogical and unsatisfying. It couldn't be genocide, because the Cylons wouldn't have had a resurrection ship nearby to infect if they weren't already too far from the homeworld to transmit back there. Therefore, infecting the entire resurrection ship could not affect the Cylon homeworld. Also, Adama's decision not to pursue the matter was outrageous whether one agrees or disagrees with the plan to infect Cylons. However, I disagree on the suicide bomber issue. The review says "the show fumbled every conceivable question about the tactic of suicide bombing, from its efficacy as a tool of war to the morality of its contexts of use, by making its suicide bomber a soldier, and his targets a paramilitary arm of the occupying forces." Just because the suicide bombers in this fictional show did not exactly parallel those we see in the real world, does not mean it "fumbled every conceivable question." The show made me wonder "under what circumstances, if any, would I ever find suicide bombing acceptable, or reasonable?" I'm not saying I answered that question, but I thought about it a lot, which means that the show succeeded on one level, anyway. Finally, I have a slight objection to the sentence "By this point, though, the viewer had already begun to lose interest." THE viewer? How about "this viewer"? Even though the fate of the show beyond season 3 is uncertain, I submit that there are many viewers who are still plenty interested. Thanks for your review -- my friends and I have enjoyed discussing it. Nicely done. You've articulately hit the nail on the head of several of the things that have been bothering me lately on BSG. It's nice to read a critical review of the show. It seems like the love affair that critics have with BSG is still amping up even as the show itself begins to descend into irrelevance. I was really hoping they could keep the quality up for more than 3 seasons. I guess not. I have to say I find myself agreeing with this review in a large part here, though my own personal tack in coming to these conclusions comes from a different direction. I think Moore and his writing team (bearing in mind Moore's most successful writing tenure to date was on the aforementioned Star Trek) found themselves enamored with the current climate to do 'edgy, insightful' television whilst hitting on so-called contemporary topics. The problem I found with this approach was that a real-life parallel can't be drawn easily in science-fiction, where a premise or a set of premises are established that don't exist in the modern day or expand or exaggerate the original idea. That is science fiction's strength and lends itself to the great science fiction stories such as the Dune and Foundation series. The current Battlestar Galactica comes at this notion from the wrong perspective; instead of offering a situation that we may not be familiar with, we get the familiar: the 'other' personified as looking human but with a strong religious ideology that differs with their supposed creators, and the main human protagonists coming up with the 'survival' argument to justify often unjustifiable moral actions. This isn't an exploration in a different setting, this is merely window dressing for making bold but undefined statements on the contemporary issues. Thus we have the broad popular reaction that the show has recieved, claims that it is intelligently exploring the issues. In fact, what the show is doing is precisely what's been said already. It draws attention to itself by proclaiming a situation, then having to say about it. Authors of a given story have something to say about their situations and aren't afraid to articulate it. The Battlestar Galactica writers aren't only afraid to say anything (for fear of censorship, perhaps?) but leave what they do say to match populist ideals and attitudes. Not surprisingly, this becomes a critically recieved show. From a differing cultural perspective (I live in Australia) I find the justified inhumanity that transpires in the show, and the blatantly broad painted signs of religious intolerance (note the Cylons with their 'one God' are painted as inhuman monsters, and also are responsible for mass murder) horrifically disturbing. Is this what Moore considers thoughtful and insightful? More often than not, the Galactica's officers act as if they've just seen an episode of 24 and find license to be as violent as they wish. Perhaps with this being the show's final season, the writers will find themselves unburdened by fear of censorship or perhaps be brave enough to find a voice to what remains a voiceless and oftentimes vacuous show. For all of its' faults, I can at least say that the original incarnation of this show had a distinct vision and voice...it's a shame that in an era of remakes, one can't break the mold and create something new.